It's a bird that we see all the time and don't even pay attention to, but the way it lives its life is incredible. They’re the most incredible bird in existence that you probably don’t know about: the common swift, a species that flies over our heads all the time, chirping away, gobbling up flies, and not really noticed by most. But scientists have found that these birds are actually quite incredible: for 10 months of the year, they never even stop to rest. That’s right, the common swift, Apus apus, flies non-stop for 10 full months – not 10 hours or 10 days – doing everything it needs to do. This bird spends an astonishing 300 days of the year eating, mating and doing everything else without ever touching Earth. 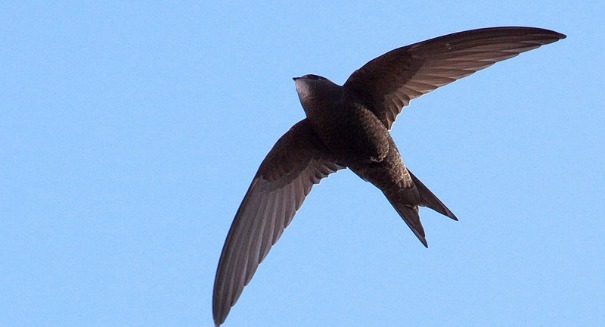 That shatters the record held by the Alpine swift, Tachymarptis melba, which had been shown to fly for about 200 days non-stop, meaning the common swift goes a full 100 days longer, according to a Cell Press statement. The reality is these remarkable birds don’t need to come down to rest at all, except in emergencies. They’re not really built for hopping along the ground or hanging out in trees, which is why they often roost on the sides of buildings. During the course of this study, a handful of birds roosted for a few nights during the winter month, but most just kept flying. Researchers published their findings in the Cell Press journal Current Biology on Oct. 27. There have been examples of birds flying for periods of months, including frigate birds and alpine swifts, but this is by far the longest scientists have ever observed them. They appear to save energy during the day by gliding in upward currents of warm air, and they ascend to high altitudes daily at dawn and dusk. Hedenstrom and his colleagues wanted to confirm this by developinga micro data logger, which monitored the birds’ flight activity, and then added light sensors for geolocation. A total of 19 common swifts were recaptured. It’s not quite clear how the birds sleep, or even if they sleep, but “the fact that some individuals never landed during 10 months suggests they sleep on the wing,” Hedenstrom said.